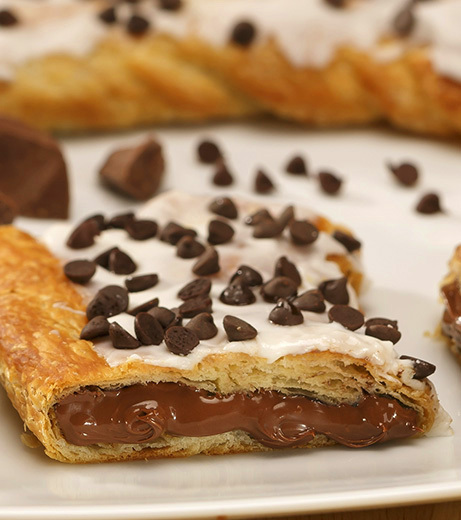 A favorite flavor for chocolate lovers! 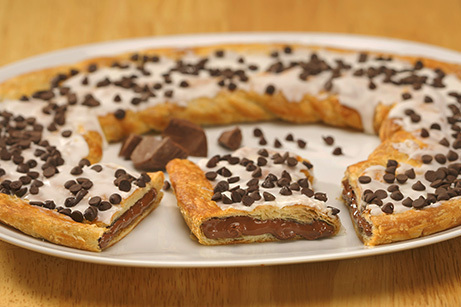 Our chocolate filled Kringle is topped with mini-chocolate chips and sweet vanilla icing. A deliciously sweet flavor for a truly unique gourmet taste! Sugar, wheat flour, margarine (interesterified soybean oil, water, salt, mono- and diglycerides, colored with annatto/turmeric. Calcium disodium edta added as a preservative. Artificial butter flavor. Vitamin a palmitate added. 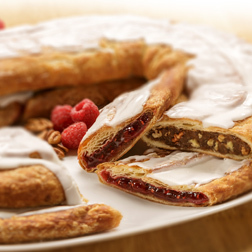 ), high fructose corn syrup, brown sugar (sugar, cane syrups), eggs, 2% or less of the following: cocoa (processed with alkali), modified food starch, salt, partially hydrogenated palm kernel oil, corn syrup, xanthum and guar gum, citric acid, soy flour, canola oil, sodium benzoate preservative, potassium sorbate preservative, soy protein, soy lecithin, yeast, dextrose, tocopherols preservative, calcium carbonate, partially hydrogenated soybean and cottonseed oil, maltodextrin, agar-agar, calcium propionate preservative, natural & artificial flavors, malted barley, corn starch, cinnamon, color added.